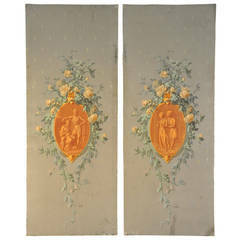 A pair of French Napoleon III period painted decorative panels with floral motifs from the mid-19th century, set inside giltwood frames. Each of this pair of decorative panels features an exquisite décor made of colorful bouquets displayed in green and blue vases. The upper and lower sections of the panel are adorned with a variation of trilobal arches, accented by delicate volutes and trellis type motifs. The lovely colors of the garlands of flowers and bouquets complement the golden hue of the simple frames beautifully. Born during the reign of Emperor Napoleon III marked by an abundance of colors and a constant search for polychrome, this pair of French decorative panels, circa 1860 will be a stylish addition to any room, from a living room to dining room or foyer. 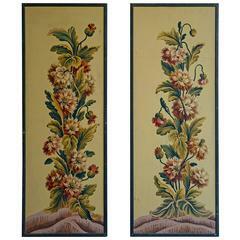 Two framed wall panels with flower decorations. Height: 155 cm Width: 58 cm. 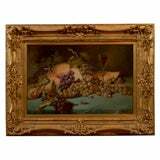 Second half of the 19th century Napoleon III French watercolor on canvas, signed, with beautiful coeval frame.